Discussion in 'Calgary Stampeders Talk' started by Rids, Sep 11, 2012. Believe it or not veteran KR/WR Jason Armstead has signed with the Calgary Stampeders too. Gonna miss Larry Taylor. Let's hope Armstead & Coker can fill the void. Damn, can't believe we lost Taylor. Here's why he was brought in. Any word on how long LT will be out? 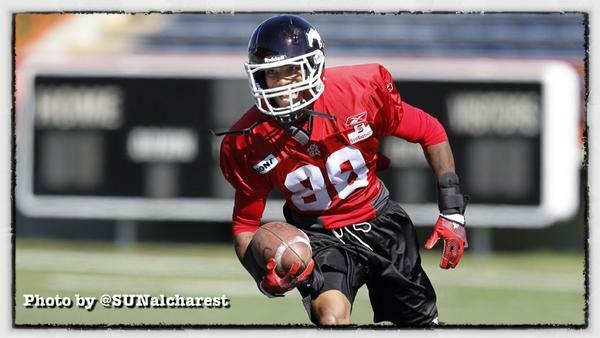 Calgary Stampeders head coach and general manager John Hufnagel is pleased to announce that import receiver/kick returner Jason Armstead has signed with the team. Armstead is entering his ninth CFL season and has recorded 13,812 combined yards and 24 touchdowns in 106 games played with Ottawa, Saskatchewan, Hamilton, Montreal, Winnipeg and Edmonton. Armstead's first day at practice. During 1999, his freshman season, he had a game in which he returned three punts for a touchdown.